The WordPress admin backend can be a daunting experience for those with disabilities. This post focusses on a WordPress plugin that I’ve created that takes some small steps to help with the accessibility of the WordPress admin screens. Much of the talk around WordPress and accessibility focusses on the production of websites that are accessible by those browsing the web, and WordPress can certainly be used to create accessible websites if key pointers are followed. I briefly covered some of these in my presentation to the a11yLDNmeetup gathering in December 2011. But what about those people with disabilities who want to use WordPress to maintain their sites. The accessibility of WordPress administration area has improved over the last couple of years but on a patchy basis. All links and input fields get high contrast focus styles so you can see where the cursor is when tabbing round the screen. A skip to content link is added at the top of the side menu to allow jumping to the main content area of the relevant admin page. Before I go into detail I want to acknowledge the work of Pat Ramsey from Knowbility.org who suggested these techniques in a presentation he gave. Screenshot showing results of Admin Menu Accessibility plugin action. 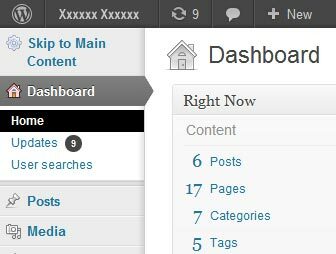 Note that the Home link within the Dashboard menu has obvious focus, and the new ‘Skip to Main Content’ link above it. To add the high contrast focus styles, the plugin adds a small extra style block to the top of each of the admin pages. The added styles influence the appearance of all links on the pages and all input fields. Wordpress functions are used to add an extra item to the top of the main admin menu – a skip link that points to the main content container within the page. I have tested the plugin with a couple of different subversions of WordPress version 3 and it seems to work OK. I have not tested the plugin with any WordPress version 2 sites. cc-admin-menu-accessibility.php – a PHP file that contains the functionality for the plugin. Place the cc-admin-menu-accessibility folder into the plugins folder within your site. Then go to the plugins page in your WordPress Admin area and activate the plugin. Deactivate the plugin from the plugins page. If you wish to you can delete the cc-admin-menu-accessibility folder from your plugins folder. I’m considering adding colour customisation for a version 0.2 of the plugin. But if you’ve got any suggestions as to how the plugin can be improved or extra features that could be added I’d be really grateful if you’d let me know. You could use the comments area below. I have been looking for this for a long time! Great job guys! Thanks for your comments, I’m glad you found it useful. looks great. are you still planning a further release? If so when would that be? Thanks for your comment Bobby. At this stage I’m not planning another release. With 3.5, there are now skip links available in the admin screens. They’re not permanently visible but they become visible when you tab to them. I will be reviewing the admin screens for accessibility more in the near future and maybe there will be some more developments.